Preheat oven to 375 degrees. Butter, oil or spray two small baking dishes with cooking spray. Place potatoes and garlic in a small saucepan. Add heavy cream or half-and-half and salt and white pepper to taste. Bring to a simmer and gently cook the potatoes for 4 minutes. Remove potatoes and garlic to a plate with a slotted spoon. Whisk grated cheese into cream until smooth. Layer 1/3 of the potatoes into the two individual baking dishes (1/6 into each dish). Drizzle both dishes with 1/3 of the cheese sauce. Repeat layering two more times, finishing with cheese sauce. 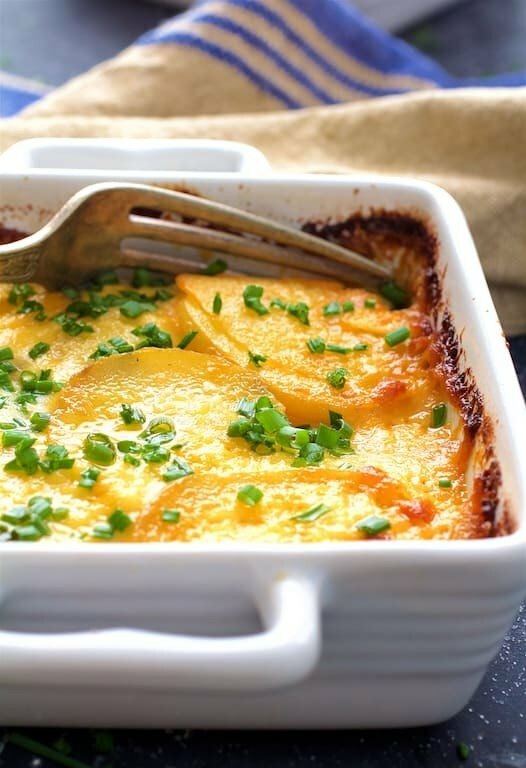 Place on a baking sheet, cover with aluminum foil and bake for 35-40 minutes or until hot, bubbling and potatoes are very tender.